One of the more annoying and frustrating things you have to deal with when working on cars is removing clamps from hoses. Until now. 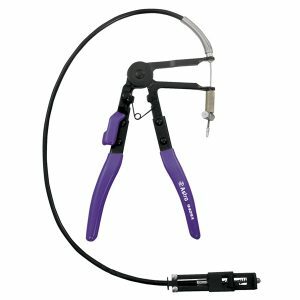 With the use of hose clamp pliers, clamp removal is nearly effortless. No more repetitively praying at clamps in a futile attempt to get them unlocked. No more struggling to keep said clamps open. A pair of hose clamp pliers can do all of the work for you with convenience and ease. Whether you’re a professional mechanic or just like to maintain and repair cars, a pair of hose clamp pliers will transform the way you do what you do. So straight to the point, one thing can be said for sure, these hose clamp pliers are good enough to make it to our list of the top 10 best Hose Clamp Pliers 2019. 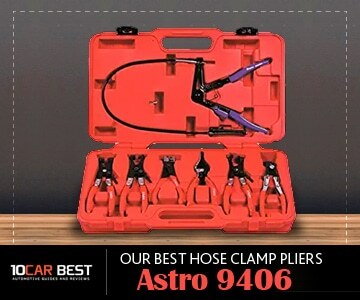 A complete set of hose clamp pliers, the Astro 9406 Hose Clamp Plier Set is the best set of hose clamp pliers on the market today. It comes with 7 different pairs of pliers with each offering its very own benefit. 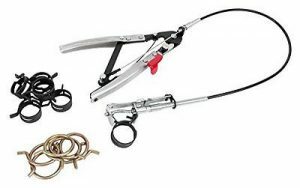 Pliers included in this set are 1 pair of standard hose clamp pliers, 2 pairs of swivel hose clamp pliers, 1 pair of angled flat band hose clamp pliers, 1 pair of hose removal pliers, 1 pair of flat band hose clamp pliers, and 1 pair of Clic-R collar pliers. 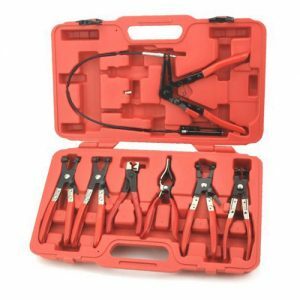 Each set of pliers helps you to remove metal or plastic self-tightening hose clamps. The set accommodates hose clamps ranging in sizes from 11/16 of an inch to 2 ½ inches, allowing it to handle just about any hose clamp it comes into contact with. Each pair of pliers in the set is capable of being locked. This will allow both of your hands to manipulate and pull off the hose you’re working with. All in all, this is a great set of hose clamp pliers for anyone who works on cars, whether it be a professional mechanic or just someone who’s trying to repair their own vehicle. Its ability to unfasten a wide variety of hose clamps makes it invaluable. And for a set of seven different pliers, it’s on the cheap side. If you’re not interested in purchasing an entire set of hose clamp pliers and think you can suffice with just one pair, you might be interested in the Astro 9409A Hose Clamp Pliers. Coming with a lifetime warranty, Astro guarantees the quality of this product. It’s capable of loosening clamps ranging from 11/16 inches in size to 2 ½ inches in size. So regardless of the size of the clamp you run into, these pliers will accommodate it. This pair of pliers has a cable attached to it to allow for additional reach. By hooking up the end of the cable to the clamp, you can simply squeeze the pliers for easy removal. This is nice when you’re working in tight areas that aren’t big enough for a full pair of pliers. So that your hands can work manually, these pliers can lock onto hose clamps. This allows you to twist and pull on the clamp and hose while it’s being clenched. While this pair of pliers could certainly be used by professional mechanics, it’s more ideal for casual car owners who are performing maintenance on their vehicles. Professional mechanics would be better suited with an entire set of hose clamp pliers as it will help to reach every angle possible. Overall, the Astro 9409A Hose Clamp Pliers are the best single pair of hose clamp pliers on the market today. 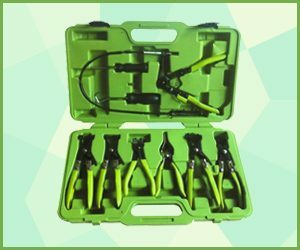 While the BETOOLL 9pcs Wire Long Reach Hose Clamp Pliers Set isn’t the best hose clamp pliers set on the market, it does offer the most value for the money. In all, it includes 7 pairs of pliers and two removal tools. Included pliers are one pair of flexible cable pliers, one pair of curved hose clamp pliers, one pair of flat band hose clamp pliers, two pairs of swivel jaw hose clamp pliers, one pair of hose remover pliers, and one pair of Clic-R collar pliers. Each pair of pliers is equipped with a dipped plastic handle for ultimate functionality and grip. For clamp removal purposes, each pair of pliers is capable of locking, letting your hands focus on the removal of the clamp. Included in a carrying case, this set is easy to transport from place to place. Whether you’re a professional mechanic or casual car owner, this is a terrific set of hose clamp pliers. Available for a very reasonable price, it provides you with a great deal of value. However, it should be noted that the case is not of the highest quality. 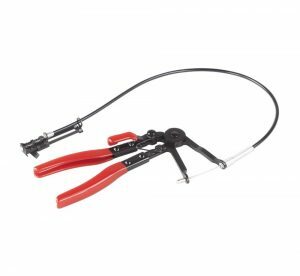 The OTC 4525 Cable-Type Flexible Hose Clamp Pliers are a terrific pair of pliers for a reasonable price. These pliers are cable wires, meaning they’re capable of reaching into narrow areas. In all, the cable on these pliers measures in 24 inches. This gives you plenty of reach regardless of what care you’re working on. Equipped with a locking mechanism, these pliers can stay attached to hose clamps without your assistance. This allows you to pull the hose off with the use of both hands. While they’re not as useful as a full set of pliers, these pliers still serve their purpose with flying colors. All in all, these are a fine set of hose clamp pliers for professional mechanics. Of course, amateur mechanics could make good use out of them as well. They’re priced reasonably and offer a great deal of value in spite of that. Another excellent pair of hose clamp pliers are the Performance Tool W80656 Flexible Hose Clamp Pliers. Available for a very reasonable price, they’re a great tool for all amateur auto mechanics. They come equipped with a 24-inch cable which can reach into narrow and distant areas, making clamp removal simple regardless of which clamp you’re removing. These pliers are designed to accommodate clamps of all sizes, covering clamps from 11/16 of an inch to 2 ½ inches. They’re equipped with a durable stainless steel handle which can be easily squeezed for maximum unlocking pressure. So that your hands can be ready for clamp removal, these pliers are equipped with locks. These locks will keep clamps open wide at all times. Overall, these hose clamp pliers by Performance Tool are a solid set of pliers for a reasonable price. 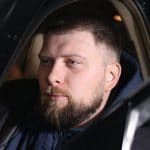 While they could certainly be used by professional mechanics, they’re designed more for amateur mechanics who like to work on cars in their free time. If you’re looking for a solid set of hose clamp pliers to keep around the house, these are a great option. 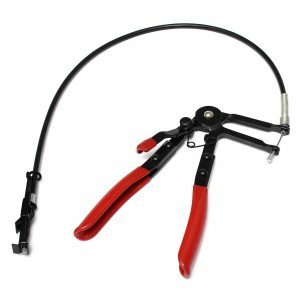 If you’re looking for a simple set of hose clamp pliers that don’t possess long cables, you should take a look at the OTC 4502 Hose Clamp Pliers Set. Flat band pliers, they are capable of fitting into narrow areas for removal of hard-to-reach clamps. While they can’t reach as far as cable pliers, they do a terrific job of opening clamps that they can reach. These pliers have jaws that swivel so that they can access clamps from a wide variety of angles. Attached ratchet locks will keep these pliers held firmly in place. This will allow you to widely unfasten clamps so that they can be seamlessly removed with your hands. 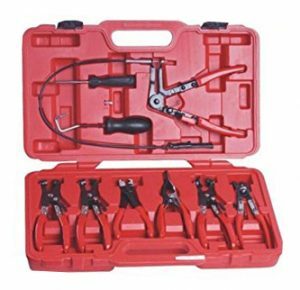 Available for a reasonable price, this hose clamp pliers set works terrifically for both professional and amateur mechanics. However, it should be noted that they don’t possess as large of a max range as some other pliers. At their peak, they can handle clamps of 1 ¾ inches. If you’re an amateur mechanic looking for a nice set of hose clamp pliers to keep around the garage, this XtremepowerUS is a great option for you. It contains 7 total pairs of pliers, including a pair of standard pliers, a pair of flat band pliers, a pair of angled flat band pliers, a pair of hose removal pliers, a pair of swivel jaw fliers, and a pair of Clic-R collar pliers. Each pair of pliers is equipped with a lock so that you can use your hands to manually remove clamps from hoses. For gripping purposes, each pair of pliers sports a tough, dipped plastic handle. This set accommodates clamps from 11/16 of an inch to 2 ½ inches. While professional mechanics could probably make due with this set, it’s designed more for amateur mechanics. These pieces perform well but are not quite as durable as you’ll find in higher-end sets. Available for a very reasonable price, this is a great set of hose clamp fliers to keep around the garage. If you’re a professional mechanic who’s looking for a great pair of hose clamp pliers, look no further than the Mayhew Pro Tools 28650. Equipped with a long cable, it’s capable of reaching narrow and covered areas. It can unfasten and lock clamps as large as 2 inches and as small 11/16 of an inch. Made with incredibly durable construction, these pliers come with a lifetime warranty, ensuring that your purchase is a worthwhile one. Allowing you to make complete use of both your hands, they possess locks. By keeping unfastened clamps opened widely, these pliers make it easy for you to slide clamps from hoses. While amateur mechanics can certainly make good use of these pliers, they’re ideally designed for professional mechanics. They’re a little on the expensive side, but with a lifetime warranty included, they’re well worth their cost. If you’d rather purchase a single pair of pliers than a complete set of pliers, this is the best pair of hose clamp pliers you’re going to find. Perhaps you’re looking for an entire set of hose clamp pliers but don’t want to spend a lot of money. 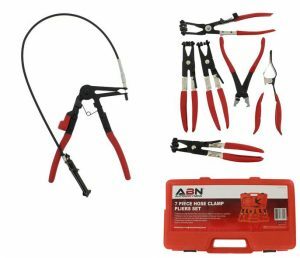 If so, you might be interested in the ABN Flexible Hose Cable Clamp Pliers Tool Set 7 Piece Kit. It includes 7 different pairs of pliers, including two pairs of swivel jaw hose clamp pliers, one pair of standard hose clamp pliers, one pair of flat band hose clamp pliers, one pair of angled flat band hose clamp pliers, one pair of hose remover pliers, and one pair of Clic-R collar pliers. Each pair of pliers comes equipped with a soft, durable plastic dipped handle. This allows for ultimate handle at all times. Giving your hands the ability to handle other objects, each pair of pliers sports a lock. You won’t have to worry about holding the pliers in place while you’re trying to remove a hose. The pliers will do just about all of the work for you. 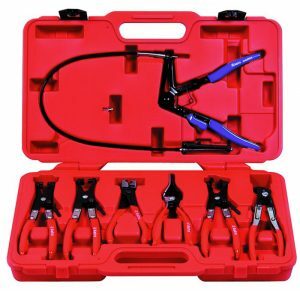 This hose clamp pliers set is great for professional mechanics and casual vehicle owners alike. While it’s very cheap, it still possesses a great deal of quality. With an easy-to-carry and durable carrying case, it’s beyond easy to bring with you anywhere. Maybe you’re not an amateur or professional mechanic. Perhaps you’re just looking for something to have on hand in case you have to unfasten a hose clamp in your car. If so, you might consider the ABN Flexible Hose Clamp Pliers. The cheapest pliers on our list, they still provide plenty of quality and functionality. These pliers possess a 24-inch cable which is capable of sneaking its way into narrow and tight areas, allowing you to effortlessly remove clamps which you otherwise would have trouble accessing. For clamp removal purposes, they are equipped with a lock. This lock will keep the clamp open wide while you work with your hands to remove it from its hose. While these hose clamp pliers certainly aren’t designed for professional mechanics, they can definitely serve their purpose for amateur mechanics and casual car owners. Unfortunately, they can only accommodate clamps of 1 ½ inches in size. But if you’re looking for a simple pair of hose clamp pliers to keep around the house, these affordable pliers are the ones for you. 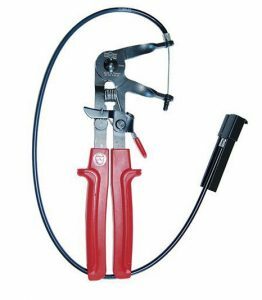 Flexible Cable – Hose clamp pliers with long, flexible cables are capable of accommodating tight and hard-to-reach areas. 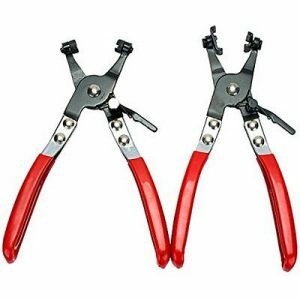 Whether you buy a set of just a single pair of pliers, you should make sure to find a pair of hose clamp pliers with a long, flexible cable. Locking Mechanism – Removing hose clamps can be difficult to say the least. Even when using a pair of pliers, you’re going to need to use your bare hands. This is why you should ensure that your chosen pliers possess a locking mechanism. Pliers that can lock onto a hose clamp will allow your hands the liberation needed to manipulate and pull off hoses. Remove and Lock Clamps – Regardless of which pair of pliers you choose, it’s important to make sure that they’re capable of handling the task at hand. A pair of hose clamp pliers should be able to remove and lock clamps into place. Read user reviews to get an idea as to the quality of each pair you peruse. Hose Clamp’s Max Opening – Hose clamps come in a number of different sizes, typically range from 11/16 of an inch to 2 ½ inches. It’s important to find a pair of pliers that can accommodate even the biggest of hose clamps. How do you use hose clamp pliers? For the most part, hose clamp pliers are fairly simple to use. You start by first making sure no pressure is contained inside of the hose you’re working with. Once this is done, you take the mechanism on the end of your pliers’ cable and lock it into the hose clamp. After the pliers’ mechanism is locked into the hose clamp, you simply squeeze the pliers until the clamp comes unlocked. If your pair of pliers has a lock on it, engage the lock so that the clamp remains open. After this is done, you simply grab the hose with your hand and twist it until it’s removed. Anyone who works on vehicles knows how difficult it can be to remove hose clamps. For some, it’s the most frustrating part of car repair. With hose clamp pliers, the removal of hose clamps becomes easy. These pliers can conveniently lock into and squeeze a hose clamp, opening the clamp up so that it can be easily removed. If you’re a professional auto mechanic or just a casual car owner who likes to repair and maintain cars, a pair of hose clamp pliers will make your job exponentially easier. The truth of the matter is that removing hose clamps is difficult. Getting the clamp to unlock, keeping it open, and jimmying it loose can be an annoying and difficult process. But with a pair of hose clamp pliers, hose clamp removal is easy. What once could take 15 minutes can now consistently be done in about 30 seconds. If you’re a professional mechanic or a car enthusiast, a pair of hose clamp pliers will make your life much, much easier.